On 21 November, the European Commission adopted its ‘Autumn Package’, including the Annual Growth Survey (AGS) 2019 and the Draft Joint Employment Report (JER). On the occasion, EAPN published an immediate Response Statement: Increase in social rights and participation but more needed to balance economic and social goals. EAPN now presents its full analysis of the Annual Growth Survey and the Draft Joint Employment Report, prepared in consultation with EAPN members. The main message from the AGS 2019 is that the EU is continuing to expand economic growth that is leading to jobs that take people out of poverty. However, although the AGS underlines that growth is not benefiting all citizens, it does not propose a systematic shift towards a different model, investing in fairer distribution/redistribution systems and a rights-based, social and sustainable development approach. The European Pillar of Social Rights (EPSR) is said to be fully integrated, but most of the social inclusion and social protection proposals are restricted, with little details, and seen primarily through the lens of instruments for growth and jobs, underpinned by trickle-down theory. Whilst some nuances have been introduced into the 3 AGS priorities, referencing the need to promote inclusiveness, as well as productivity growth and institutional quality in structural reforms, together with new funds and link to EU funds, it is not clear how far this will be used for social investment in social rights. 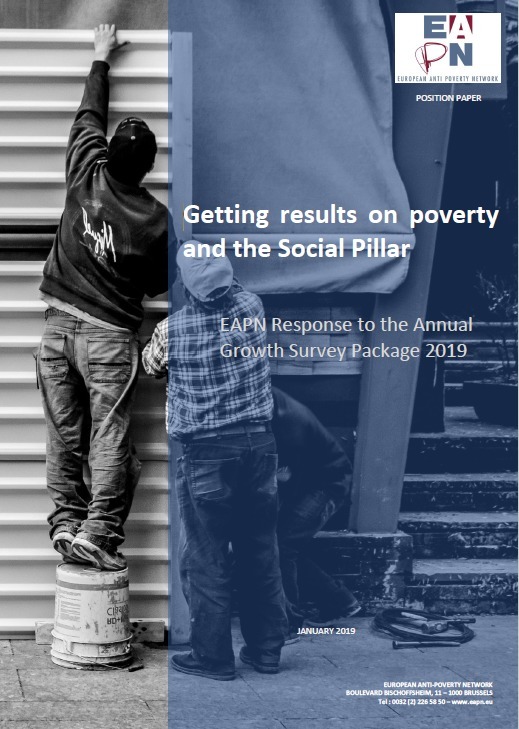 Overall, whilst the AGS 2019 takes some welcome steps with increased mentions of poverty and social rights as well as to the role of civil society, it falls short of rebalancing economic and social goals or a road map to deliver concretely on poverty and social rights, implementing the EPSR and the Agenda 2030 SDGs, with people in poverty and NGOs as key partners. In order to achieve a Poverty Free Europe, these high-level political commitments must be translated into actions on the ground, which create meaningful changes in the lives of the 113 million people still at risk of poverty and social exclusion, if EU commitments to its citizens are to be believed. Invest in adequate income for all – guaranteeing minimum income and social protection as a social right!